A land sale, a zoning change and plans for a new 15,000-square-foot building made their way through Sandy City Hall friction-free in 2013; no neighbors protested and no council members objected. To be built is a new home for the Sandy Club, a nonprofit after-school program that is widely cherished and receives a yearly grant from the city. The club’s executive director, Linda Martinez Saville, is a 16-year veteran of the Sandy City Council. 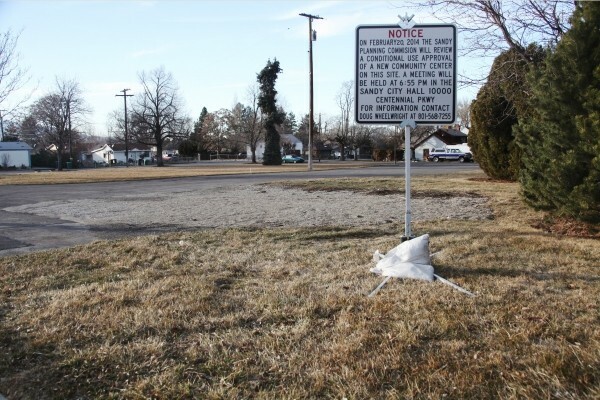 The land, currently an unoccupied acre lot, was sold to the club for $400,000. The terms of the deal, at least for the city of Sandy, were unprecedented: the city acted as the bank, holding onto the paper while the club agreed to pay $20,470 per year over a 20-year term. And city officials agreed to increase the amount of the club’s yearly grant—$105,000 in 2013—by $20,000 to make sure the payments flow. City officials had the land appraised twice, at a cost of $2,450, and in multiple interviews, it was said the land was sold for “fair market value.” But questions about fair market value may be moot, as by increasing its contribution to the club, the city essentially picked up the tab for the purchase. So far as the city’s concerned, all of its actions were properly noticed, recorded in open public meetings and executed appropriately and fairly. Yet many Sandy residents who live in the city’s historic district—where the club currently resides and also where its future home could be—say they didn’t know about efforts to relocate the club until January, when the city was preparing to put its final stamp of approval on the project. And now that they do know, some have protested the size and scale of the building and wonder how they remained in the dark as the city took action after action. “I think they did everything to the letter of the law but they used every loophole they could find,” Christensen says. The lack of public participation in the process has been magnified by the close relationship between the club’s founder, Saville—who severed the club from the national Boys & Girls Club about eight years ago to prevent money it received from the city of Sandy from flowing to the national organization—and the city council that she has served on for nearly two decades. Though Saville and city officials say she is steadfast in recusing herself from discussions about the club, city records show this isn’t always the case. Two large hurdles had to be overcome in order to press forward with relocating the club. The first was the sale of the land. Initially, the club was to lease the property, and according to Nicole Martin, a Sandy city spokeswoman, the council approved the lease option with an informal “nod” in August 2013. In September, the item came back to the council. Another informal, and approving, nod was given. This time, Martin says, the council gave permission to city staff to negotiate a land sale, for which formal council approval is not needed. Since the discussion took place during the council’s planning meeting and no vote was taken, no mention of the land sale is present in the minutes. Sandy Mayor Tom Dolan recalls this discussion. In order to help the club pay for the land, he says, the city intends to increase the grant it gives the club by $20,000 in coming years. Dolan says he doesn’t feel handing the money back and forth in this manner amounts to giving city land away for free. With the land sale sealed up, the next hurdle was zoning. The lot, located at 8768 S. 280 East, is in a residential zone, but has a long history of public use dating back to 1881, when the city’s first school was built there, according to Doug Wheelright, the city’s development-services manager in the planning division. Since construction of a community center isn’t permitted in a residential zone, the city set forth to amend the residential code to include the use of community centers. As Wheelright notes, it wasn’t a rezone so much as it was a permanent redrawing of the zoning law. This move, though, did require a formal vote from the Sandy City Council. Minutes from the Oct. 1 meeting show that Saville joined her colleagues in voting unanimously to change the zoning law. Martin, though, says Saville recused herself and that the minutes are incorrect. Although Christensen says it would be inappropriate for Saville to vote on actions involving her business, her main cause for concern is that a large project that will have impacts on her neighborhood could gallop through the process without her knowledge, or that of anyone else she knows. Some people in the neighborhood, though, did know. And they, too, have strong opinions about the proposed building, which the Sandy City Planning Commission is expected to approve Feb. 20. Tim Zuver, a member of the city’s Historic Committee, says talk of relocating The Sandy Club from its current home in the basement of the city’s aging parks and recreation building (about 1,000 feet to the northeast of the new location) has swirled for years. “I’ve known about this forever,” he says, adding that he feels the opponents have “poisoned” the neighborhood with their door-to-door campaigns. But Christensen says neighbors opposed to the plan believe the club is an asset to the community and merely object to the new building’s girth, its extended hours of operation (7 a.m. to 10 p.m.), a lack of parking and the building’s 34-foot height. Many of the issues she raises were discussed during the Feb. 6 meeting and have been modified, Wheelright says. Christensen says she had to ask the city council twice for a sign to be hung about the Feb. 6 meeting. Had residents failed to recognize the project prior to the Feb. 6 meeting, Wheelright says the Planning Commission likely would have made a decision. However, heeding public outcry, Wheelright instead pegged that meeting for public comment. Though she doesn’t attend every city council meeting, Christensen says, she tries to pay attention to what’s happening in her city, and especially just down the street.